NRMCA President Robert Garbini, Chief Operating Officer Nicole Maher and the staff wish you and your families a happy holiday season and a healthy and happy New Year. Please note that E-NEWS will not publish next week, but will resume for the week of January 5, 2015. Just how much concrete is needed for the new Tappan Zee Bridge that will span the Hudson River north of New York City? About enough for a sidewalk from the project site to Key West, FL. That's according to a December 13 story by The Journal News which details ready mix supplier Tilcon New York's role in the bridge construction project. Read more. The tallest building in the City of Brotherly Love is set to be built, courtesy of one of the largest concrete pour's in the city's history, according to a December 13 broadcast by WFMZ-TV. Crews are working to pour 400 truckloads of concrete to make a 10-foot thick skyscraper mat that will hold the Comcast Innovation and Technology Center. Read more. An international research team has revealed important clues to the longevity of such Roman architectural marvels as the Pantheon, Trajan’s Markets and the Colosseum. Led by researchers at UC Berkeley, Lawrence Berkeley National Laboratory and Cornell University, the team discovered that the long-term resilience of the concrete is due to the mineralogical changes that occur as the Roman volcanic ash-lime mortar cures. The Romans developed a standard formula for making this mortar about 2,000 years ago. The mortar binds cobble-sized fragments of tuff and brick, and it was used in the concrete walls of many monuments in Rome. December 15 news release by the University of California at Berkeley. Read more. 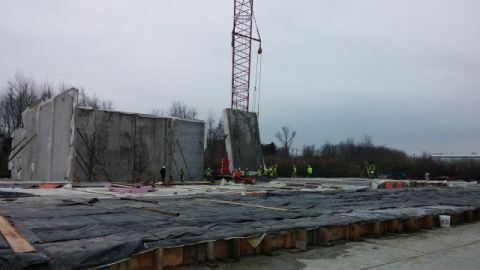 The Connecticut Food Bank is currently constructing an 82,000 square foot warehouse facility in Wallingford using Tilt-Up Concrete panels, reports NRMCA Senior Director, National Resources, Doug O'Neill. Local representatives from the design community, business owners and elected officials were invited by Claris Construction, Inc., a tilt-up concrete contractor based in Newtown, CT, to attend a "panel raising" (shown here) to show the ease at which tilt-up concrete construction projects move along to completion. Close to 3,000 yards of concrete was delivered by NRMCA Producer member F&F Concrete based in Plantsville, CT, which included both the floor slab and the cast in place tilt-up walls. Each panel consists of an interior and exterior wall section separated by foam insulation and a plastic moisture barrier. These panels, approximately 30 feet high, were cast horizontally and then tilted up into place using a crane. The erection team can tilt-up one panel every 15-30 minutes, which allows for the facility to be totally enclosed in a matter of a few days, noted O'Neill. In attendance were several representatives of NRMCA Associate member A.H. Harris including President Kim Corwin who is also the current president of the Tilt-Up Concrete Association. Ms. Corwin is an advocate for promoting the use of tilt-up concrete construction across the country; the team at A.H. Harris are eager to collaborate with NRMCA members and partners to advance the use of tilt-up concrete construction methods. In addition to O'Neill, his Connecticut promotion colleague Jim Langlois, executive director of the Connecticut Concrete Promotion Council, were also in attendance. For more information on this project and on tilt-up concrete construction in your area, contact Doug O’Neill at doneill@nrmca.org. The preliminary estimate of ready mixed concrete produced in October 2014 is 35 million cubic yards, 10% higher than that in October 2013. The estimated production through October 2014 is 279 million cubic yards, 8.1% higher than that during the same period in 2013. Ready mixed concrete production is estimated from cement shipments reported by the US Geological Survey. Detailed information is available to NRMCA member companies here. NRMCA is pleased to announce that the 2015 Sponsorship Program is now available. With over 6,000 members and partners in the ready mixed concrete industry who rely on NRMCA for training and information, NRMCA is a powerful force in the ready mixed concrete industry around the globe. Click here to examine the numerous opportunities in the NRMCA Sponsorship Kit to reach key buying influences in the industry. Regardless of your budget, you’ll find opportunities that can deliver to a powerful, receptive audience at an affordable cost. Sponsorship opportunities are limited and sold on a first-come, first-serve basis. So act now to join the growing list of members who support NRMCA through annual sponsorship! For more information about NRMCA’s sponsorship program or to discuss a custom sponsorship package, please contact Kathleen Carr-Smith at kcarrsmith@nrmca.org or 240-485-1145. Last Friday, the U.S. Environmental Protection Agency (EPA) published its controversial and long-awaited final rule regulating the disposal of coal combustion residuals (CCRs), also known as "fly ash." Of concern to the ready mixed concrete industry was the potential for EPA to classify the material (a vital ready mixed concrete ingredient) as a hazardous waste, thus subjecting the material and industry to greater risk and forced decreased use of fly ash. However, in a major victory for the ready mixed concrete industry, EPA instead has classified CCRs as a "subtitle D" solid waste, eliminating the hazardous waste label and allowing for the continued beneficial use of fly ash in ready mixed concrete. Additionally, the final rule supports the responsible recycling of coal ash and distinguishes safe, beneficial use from disposal. EPA highlighted that beneficial use of coal ash can produce positive environmental, economic and performance benefits such as reduced use of virgin resources, lower greenhouse gas emissions, reduced cost of coal ash disposal and improved strength and durability of materials. This echoes the study EPA did in February that concluded the use of coal fly ash in concrete and synthetic gypsum in wallboard is safe and that these are appropriate beneficial uses for coal fly ash recycling. The rule, originally proposed in 2010, was panned by multiple industries as being unnecessary and merely a knee-jerk reaction to a coal ash containment pond release in 2008. Following the publication of the proposed rule in 2010, NRMCA set down a very strategic four-year long path to help bring about the current rule and remove any relation to the hazardous waste label. Through coordination with multiple other groups and industries, NRMCA was able to achieve this incredible win for the industry. Click here to view the final rule. For more information, please contact NRMCA’s Elizabeth Fox at efox@nrmca.org. This past Tuesday (12/16), President Obama signed into law legislation funding the federal government through September 2015. Contained in the legislation is a provision that temporarily suspends the two restrictions that had been placed on the use of the 34-hour restart: the two 1 a.m. - 5 a.m. periods and the once-a-week use requirements. Following President Obama’s signature, the use of the 34-hour restart provision reverted to the pre-July 2013 standard, meaning drivers who need to restart their weekly on-duty clock after having been on-duty for 60 hours in seven days, or 70 hours in eight days, now can simply go off-duty for 34 consecutive hours. Drivers no longer will need to take the restart provision over two night periods and they can use the restart provision more than once per week. However, since this is a spending bill that only lasts through the end of Fiscal Year 2015 (September 30, 2015), it means that the 34-hour restart change also only is effective through September 2015. To be clear, all other HOS provisions remain in effect, including the 30-minute break provision, 11-hours driving time and the 14-hour driving window. While most drivers in the ready mixed concrete industry are able to take advantage of the construction materials delivery 24-hour restart exception [49 CFR 395.1(m)], drivers in the industry who drive commercial motor vehicles to haul cement or aggregates are required to use the 34-hour restart. Cement and aggregate haulers, or mixer drivers who frequently switch to either of these driving functions, will be the select few that be impacted by the change. All other provisions of the HOS rules remain unchanged. Click here to view the enforcement suspension language. For more information, contact Gary Mullings at gmullings@nrmca.org or Kevin Walgenbach at kwalgenbach@nrmca.org. Click here to view OSHA’s guidance and resources. For more information, contact Gary Mullings at gmullings@nrmca.org or Kevin Walgenbach at kwalgenbach@nrmca.org. Media articles on Congress, transportation infrastructure, regulation, taxes and other subjects, each of which relate to the ready mixed concrete industry, are updated each week by NRMCA's Government Affairs staff. To access the most recent compilation of articles for December 15 - 19, please click here. The House and Senate passed approved legislation (H.R. 5771) to extend for one year a number of tax provisions that expired at the end of year 2013. This has been in the works for most of this year and bipartisan negotiations for a longer-term extension collapsed after the President issued a veto threat of a nearly completed package. The one-year bill prevents a tax increase on families and businesses as taxpayers begin to file their taxes for 2014. Among the tax provisions extended was the reinstatement of bonus depreciation for 2014. Associated Equipment Distributors has provided detailed information for you about the capital investment incentives in the package. Click here for more information. • Extension of research credit. The section by section summary can be found here. For more information, please contact NRMCA’s Elizabeth Fox at efox@nrmca.org. On Friday, the National Labor Relations Board (NLRB) named McDonald’s Corporation as a joint employer with 13 charges involving alleged unfair labor practices committed by McDonald’s franchisees. This echoes General Counsel Robert Griffin’s assertions in July that the joint employer standard should be changed to a much broader definition "if one of the entities wields sufficient influence over the working conditions of the other entity's employees such that meaningful bargaining could not occur in its absence." (Read more.) The current standard is that a secondary company can be judged a "joint employer" if it has "direct and immediate impact" on the worker's terms and conditions - if that second company is involved in hiring and determining pay levels. If the NLRB uses the new joint employer standard in its decision in the Browning-Ferris case it is expected to decide shortly, this could have a dramatic impact on what it means to be an employer and an employee. Browning-Ferris involves a subcontractor/contractor relationship at a recycling facility. A new joint employer standard could mean that many contracting companies and franchisers find themselves designated as joint employers of their contractors' and franchisees' employees. NRMCA joined the Coalition for a Democratic Workplace’s amicus brief on Browning-Ferris and will continue to monitor changes in labor law closely. For more information, please contact NRMCA’s Elizabeth Fox at efox@nrmca.org. The NRMCA December Internet Spotlight, which is good through Tuesday, January 6, is the Concrete Overlays of Asphalt Parking Lots bundle set. This packaged bundle contains 25 copies of NRMCA’s Guide to Concrete Overlays of Asphalt Parking Lots: The purpose of this 64-page book is to provide information for decision makers and practitioners about selecting, designing and constructing successful concrete overlays on existing asphalt parking lot pavements. Also, receive a FREE copy of the Concrete Overlays of Asphalt Parking Lots Flip Book: This flip book provides a primer to an industry promoter, concrete sales person and concrete contractor on the proven technology of using concrete to overlay and renew existing asphalt parking lots. Packed in 20 pages in a popular flip book format, the guide includes presenter notes and touches on: "How and Why" concrete overlays work; "Rules of Thumb" for evaluating an existing parking lot and determining concrete thickness, "Best Practices" for placing concrete overlays, and "Quick Case Studies" of successful projects. Order online today and receive 30% off. Regular member price is $179, Internet Special $125.30, plus shipping. Use Discount Code: ISDEC14. Regional Concrete Technologist Training and Certification Course "Short Course"